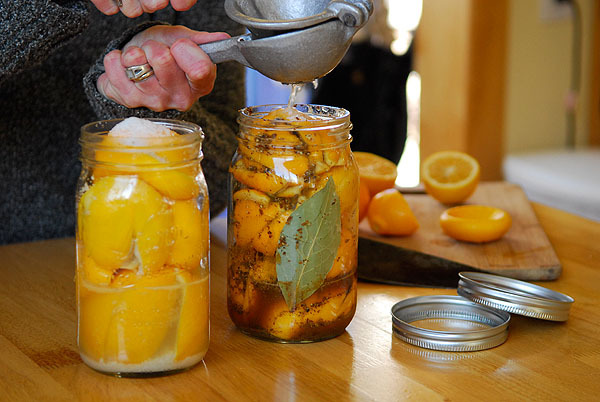 Making preserved lemons (more than a month ago) with fruits from the California yard that grew the tree from which these beauties came. Just a quick post to let you know we are in transit. It’s been a long haul, these past few months, and I’m way behind on stories here. I apologize for that, but I promise more to come as we transition from New Mexico to lands far, far away (Asia, North Africa, Europe…). But right now, I’m indulging in a bit of California sun on a breezy patio surrounded by flowers and trees. I’m sipping a crisp, clean glass of white wine while nibbling on artichokes, olives and cheese. And I’m taking the next few days of rest. It’s a long time coming. If all goes according to plan, I’ll meet you again next week in Phnom Penh. And, among other things, I will soon fill you in on these lemons. Meanwhile, eat well and be happy. Just read an article I think you wrote published in Massage Mag 2003, Seeing By Hands on blind masseuses in Cambodia. Would love a similar story for a book we are putting together on Cambodia: Unsung Heroes (a collection of short stories about extraordinary projects that help people). Are you interested? I’m sending you an email right now….